In the great fashion war...TEAM FIERCE OR TEAM DANDY? Discussion in 'Trend Spotting' started by dannydaily, Apr 13, 2009. Kanye would probs write a song about the war wait until he looses out on a grammey and then pew pew. oh my eyes deceive me. Are all of them wearing heels? the fact that I've seen those Margiela sunglasses on that guy like 10.000 times (which was not on always the same outfitpic) makes their team lose. HELLO team fierce for the win. 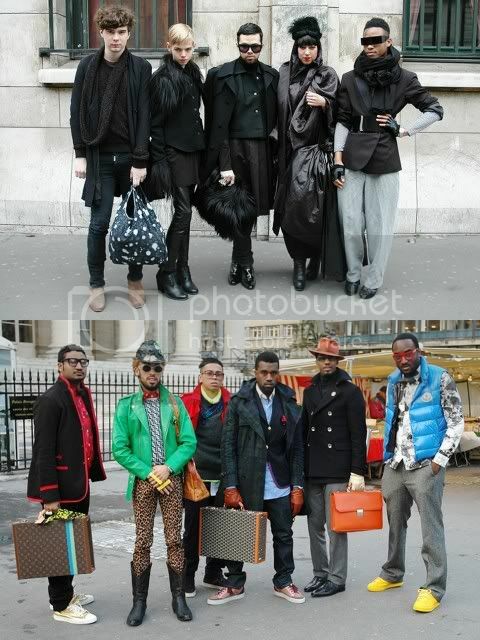 i mean the guy in the green in kanye's group is wearing a LOGO fendi sweater....eww much! eesh. how about Team VogueParis ?! i'd fangirl team HamishBowles any day. ah ha ! both teams are bad *** ! but i dont think they both are on competing each other. ^ lol yes. Which team is surviving on ramen noodles to pay for the overpriced designer gear?
! i'll go with TEAM FIERCE ! Now normally I'd pick "Team Fierce", but Team Dandy has been on South Park and I think that gives them a leg up on the competition. OMG--I thought the same thing! But don't you think it goes with the crazy leggings, cowboy boots, fedora AND ... knuckle dusters!!!!!!!!! Lol Ramen is pricey in Europe. How can I join Team Dandy? Sign me up. He trumps all of those little wannabe's a$$es!